At least a 25k attendance for this but sales don’t look great on the eticketing. Sales should be going crazy and nothing short of at least the lower bowl being full is acceptable. 2nd in the league, a win would only mean 5 more points needed for promotion even if Fulham win Friday night. Time for all those fans to come back and get behind the team regardless of the past. If people want to go then they will, its a stupid kick off time, I don't agree with it. I haven't decided if im going yet. It'll be a good bit higher than that I hope although its difficult to gauge the effect the time will have. Its a fixture at the top in an exciting end to the season. If people can be there they will. SKY have no consideration for the fans, what a stupid KO time. But who gives a **** I will be there as always. I think Sky thought this would be the game that we’d be promoted - obviously that’s impossible now. Crowd will definitely suffer because of the kick off time. Wouldn't bother me what kick off time it is - Infact under the lights it's more exciting! Once a blue always a blue44 wrote: Wouldn't bother me what kick off time it is - Infact under the lights it's more exciting! absolutely gutted won't be able to make this fixture because of kick off time . 2blue2handle wrote: If people want to go then they will, its a stupid kick off time, I don't agree with it. I haven't decided if im going yet. Sorry, and I don't know your circumstances, but I just don't understand people who care enough to be on this forum constantly and then come out with a statement like that for such an important game. It's not a criticism, I just don't understand it. Its simple, I have family plans on Saturday night, so I’ll decide closer the time if I want to let them down or miss the game. The fact it’s a big game doesn’t make too much difference to me, I have a season ticket this year, and have renewed for next year and I go to the games I can and that’s that really. Cardiff City is a big part of my life but it isn’t my entire life, there have been plenty of big games before and there will be plenty again. It doesn’t it mean I want them to win any less because I’m not in the ground. If I don’t go it will probably be hidden on my phone with sky go on. If it was pretty much any other day or kick off time then I am almost certain I would have gone. I want to go and was going to the 3pm kick off but as it's moved to the evening, because of health problems I cannot manage it. I'm the same as you, had a family night out booked for months. If I go to this game, I'll be in the doghouse for a long time. I probably won't be there, but I hope we win and everyone who goes enjoys themselves. 22,000 is my estimate. Expect sales to rocket if Fulham lose to millwall....if that happens I reckon people will start to believe. Looks like quite a few gone today. They should have done a deal on tickets for this one. We should be getting 25k for this at least anyway. Hoping the late kickoff means everyone has had a few beers and it ramps up the atmosphere! I wonder how many would be able to make it if we where playing Man U or Liverpool at 7:45 this Saturday? 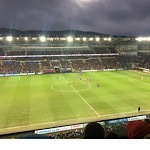 Ebbw Blue wrote: I wonder how many would be able to make it if we where playing Man U or Liverpool at 7:45 this Saturday? Plenty of lame excuses. JUST GET THERE!!!! Escott1927 wrote: They should have done a deal on tickets for this one. We should be getting 25k for this at least anyway. The rate of sales is looking pretty good to me. Be surprised if its not well, well over 25 k with very few away fans. The Saturday is a pain for a lot but probably opens up going to the game for many others. Those that work and those that play sport on Saturday can go. Those reluctant to take their kids on a week night likely to be more liberal with there being no school the next day. Transport bit of an arse possibly but that's been the case recently with games kicking off in the middle of the day. Sales for Reading also looking very good. Must be a possibility that it will top 30k.